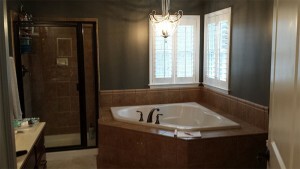 Bathroom Remodeling in Fridley MN | Bannochie Builders Inc.
Bathroom remodeling is one of the most popular major home improvement services done in the United States. Whether big or small, everyone loves an alluring bathroom. Not only does a renovation enhance the beauty of your home, it also increases its property value. If you’re looking for a fresh new look with custom finishes layered with your unique touch, Bannochie Builders can help. Whether rustic, classic, or modern looks appeal to you, Bannochie Builders will provide you with a variety of options to choose from. Only using the best products and materials on the market, we will customize your bathroom from top to bottom. With our help, we will bring your out to date bathroom back into the modern world. No matter what your taste or style is, we have the solution for you. Whether you’re looking for a delicate and romantic style, something that’s a little more eye-catching and bold, or maybe a little bit of both, Bannochie Builders will provide a unique style for every customer. We know there are a lot of contractors to choose from when looking to remodel your bathroom. At Bannochie Builders, we appreciate the opportunity to work with you on your next project with competitive prices. If you’re looking to remodel your bathroom, call us today!